I installed the latest version of Photoshop last week: CS 6. I fired it up and the first and most obvious thing I noticed was the base interface has been changed to a much slicker looking, smoked gray color. I haven’t quite got all of the newer intricacies figured out yet, but that would require reading and unless funny pictures are connected to the words in some way, I’m just not interested. The reason I upgraded was to get the Adobe Design Package that included InDesign. I have been building iPad eBooks with the Apple app called iBooks Author, but there seem to be some limitations with it that will not work for what I am trying to do. Hopefully I can get InDesign figured out and accomplish what I want with it. I am hoping there are funny pictures in the InDesign instruction manuel. Hello Dennis- Absolutely love your work and your blog. (I must admit I find your work inspiring & demoralizing all at the same time. In the end it keeps me sketching so all is good!) I too loaded Pshop CS6 the other day and had the same reaction to the new interface. I wanted to pass along to you that I discovered that you can adjust the color of the interface in preferences making it darker or lighter to suit your tastes. Seems this is a new option across the Adobe apps. (AI, After Effects, Etc.) A nice addition I think. Thanks for the great blog and for sharing your work. I’m envious of your abilities. I’m a bit apprehensive about figuring out InDesign. Being some what accomplished in Photoshop, I can still remember opening Illustrator for the first time. It looked just like Photoshop and I got all excited thinking I’m gonna rock this program. 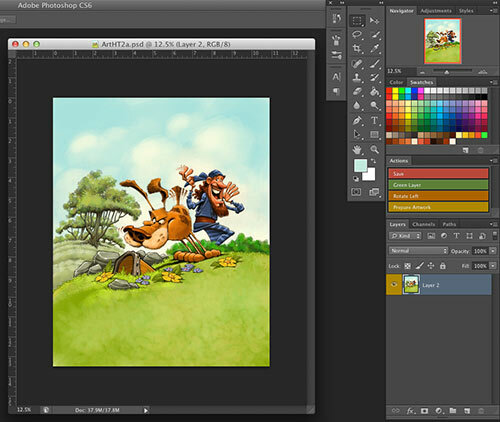 Unfortunately, even though the two programs look alike, they are two very different animals, and Illustrator ended up rocking me. Hopefully I will have better luck learning InDesign. And to think, I was just gonna rant about the 3 new crayon colors. They still need to improve the overall taste.